The 2019 Joint Summer Meeting will be held July 6-11, 2019 at the Hotel Chaco in Albuquerque, New Mexico. This will be a joint meeting of the Western Region CARET representatives, Deans and Directors of Extension, Experiment Station, and Academic Programs. The theme of the meeting will be “The Future of Western Agriculture”. Attire will be Western Business Casual (no ties). An agenda will be posted soon along with registration links. 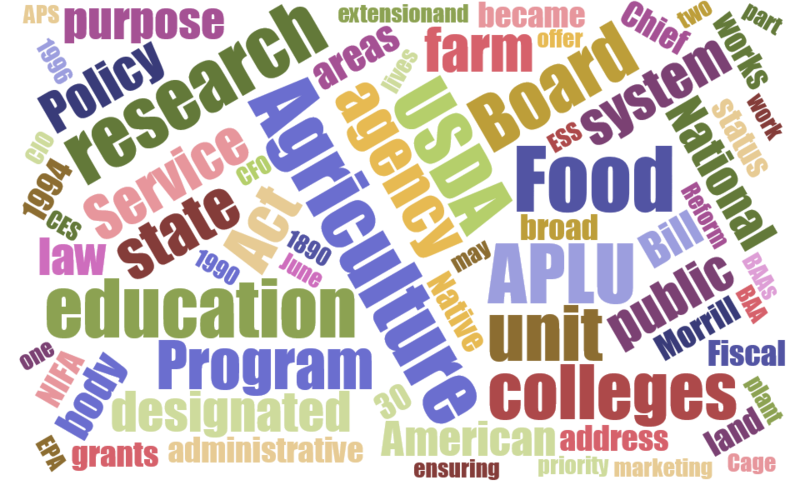 BAA, APLU, WAAESD, NEED, AHS, NIFA…trying to make sense of the alphabet soup of acronyms casually and expertly tossed around at meetings? Download our Acronym Guide! The National Information Management and Support System (NIMSS) is a web-based application that allows participants of Multistate Research Projects to submit proposals and reports online and register to participate on projects. Interested parties, stakeholders, and cooperators can also query the NIMSS for relevant and timely information on multistate projects. In 2015, a new and improved version of this online database and project management system was launched. As part of the launch of the new NIMSS, a new basics training video is now available. This 35 minute video covers most of the functions required for Administrative Advisors and those functioning as or on behalf of an AES station director. A handbook on the New NIMSS is also out now, and will be updated periodically as the New NIMSS is refined. As always, please feel free to contact me or your respective NIMSS regional system administrator (RSA) with any questions about the new NIMSS or the multistate program. Research Reporting: Why it matters and how to do it well. Annual reports are the basis and foundational source material for the impact reporting conducted by science communicators at Land Grant Universities. In an effort to improve the quality of reports submitted to NIMSS, REEPort, the National Land Grant Impacts database and other databases by all research and Cooperative Extension personnel with reporting responsibilities, Sara Delheimer, the Impact Communication Specialist, has developed a short Prezi, “Research Reporting: Why it matters and how to do it well,” that explains what good reporting looks like, including examples. All Multistate Committees are encouraged to view this presentation as part of their regular annual meetings and make adjustments to their annual reports, accordingly. In addition, directors are encouraged to share this presentation with faculty. Workshops for Faculty/Impact Writers: For the cost of travel, Sara Delheimer can deliver a customized workshop to faculty and impact writers at your institution designed to improve reporting of project impacts. Email Sara Delheimer for more information. Click “start Presi” in the screen above or click on the link: http://prezi.com/lmiicky_liuu/?utm_campaign=share&utm_medium=copy. A presentation window will appear on your screen. Turn on your speakers. This presentation includes a voice over. Click the “full screen” button in the navigation bar at the bottom of the presentation window. Use right and left arrow keys to navigate back and forth between slides. Double click on the Prezi icon to play the presentation. The 2013 Western Region Teaching Symposium will be held September 13 & 14, 2013 at the University of Wyoming in Laramie, WY. New this year, you can attend the Western Region Teaching Symposium virtually! All major presentations will be available through streaming video, so you can watch, pose questions to the presenters, and learn from your desk. Presentations will also be archived for viewing later if you have a time conflict with a presentation you really want to see. For complete information and meeting registration (free! ), visit the website. The North Central region and The Ohio State University, our 2013 hosts, are pleased to announce that registration is now open for the 2013 Fall ESS/SAES/ARD meeting, scheduled for Tuesday, September 24 through Thursday, September 26, 2013 at the Hilton Easton, Columbus, OH. 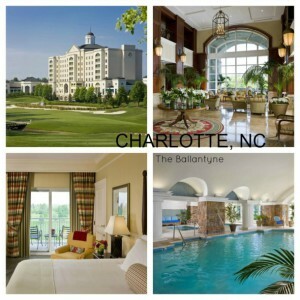 Click here for links to registration, hotel room reservations, and the overall meeting schedule. An agenda for the WAAESD portion of the meeting will be posted soon!